Back ground: Multiple sclerosis (MS) is an inflammatory disease in which the insulating covers of nerve cells in the brain and spinal cord are damaged .MS is a chronic disease of the central nervous system characterised by multicentral inflammation and myelin destruction . Magnetic resonance imaging (MRI) is now widely used for diagnosing MS and detecting clinically silent lesions. However, correlations found between conventional techniques, such as T2-weighted lesion load, and disability, are weak or absent and therefore, neither the magnetic resonance techniques nor clinical measurements are gold standard to assess disease or disability.Alteration of NAWM is of great importance because its true patho-physiological significance is not completely understood. Decrease in N-Acetyl Aspartate (NAA) has been used as an marker of axonal damage or loss that presumably appears secondary to inflammation or demyelination ,although primary axonal damage is not excluded . Objectives : Demonstrate the limitation of convenential magnetic resonance techniques. Observation the pathological processes in NAWM by MRS. Correlation between the results of MRS and the physical disability of the patients using EDSS . 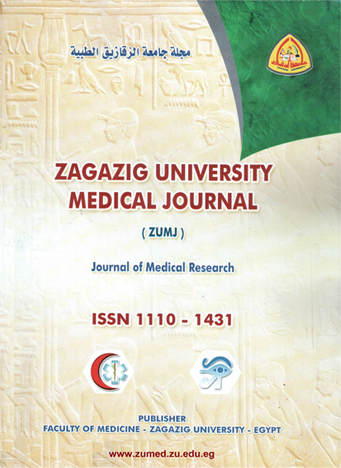 Subjects and methods: This study was carried out on 23 patients with clinically definite multiple sclerosis patients, who met the criteria of clinically definite MS according to McDonald criteria 2010, selected from Neurology Department, Zagazig University Hospitals ]10[. Results: We found that the mean value of NAA and the mean ratios of NAA/CR and NAA/ CHO were significant lower in the Cases but the mean values of MI and GLX are significant higher. . Also there was significant negative correlation between the mean value of NAA in MS plaque by MRS and EDSS score as a measure of disability. There was significant negative correlation between the mean value of NAA in NAWM and EDSS score . Discussion: We have clearly demonstrated a correlation between an MRS measure and EDSS. EDSS seems to reflect the existence of irreversible disability probably related to axonal degeneration.